Tensions ran high at a ‘town hall’ meeting held on Tuesday between a crowd of approximately 150 students and some of Concordia’s senior administrators, including interim President Frederick Lowy. Lowy, along with VP services Roger Côté and VP institutional relations Bram Freedman, addressed students’ questions regarding the administration’s response to the ongoing strike against impending tuition fee hikes put in place by the provincial government. One of the main concerns brought up by students was the privatization of higher education in Quebec. Many stated that they felt the tuition fee increase was unfair, unnecessary and uncalled for. Lowy insisted that Quebec universities must be funded along the same lines as other Canadian universities in order to provide the same education. “If you feel Quebec universities could somehow manage on less, then that’s something you must justify,” Lowy said. The right to strike as a form of protest, the heightened presence of security at the university and the mismanagement of funds were also addressed by both the administration and the students. Trevor Smith, VP finance of the Geography Undergraduate Student Society asked why it took Lowy six weeks to hold this meeting and criticized how the administration had handled the student strike so far. “I’m really ashamed of it,” Smith said. “This is our first strike and probably not our last strike,” he added to a round of applause from students. said it was a necessary step. 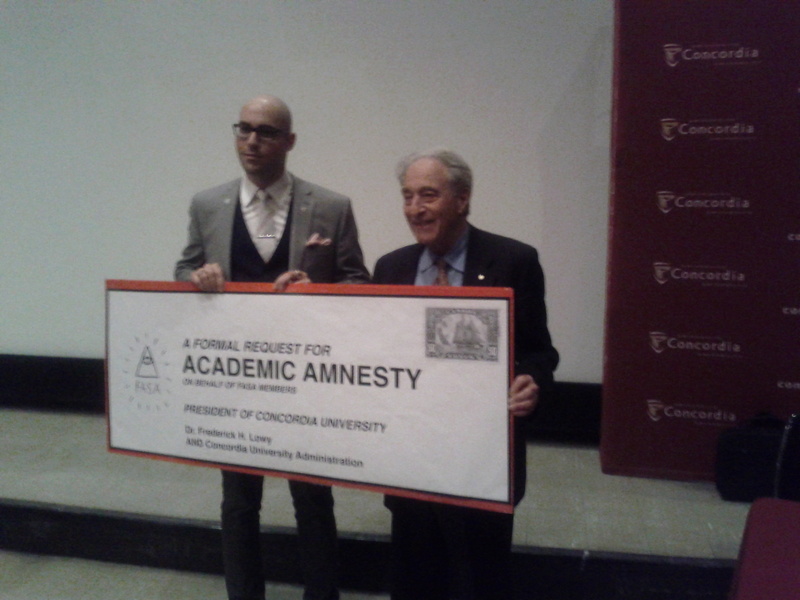 At one point during the discussion, two representatives from the Fine Arts Student Alliance, including president Paisley V. Sim, presented Lowy and the other administrators with a formal request for academic amnesty shaped like a giant cheque. FASA has been on strike since the beginning of March and is in the process of holding a referendum to decide whether or not to continue through exam period. The town hall meeting ended at approximately 1:15 p.m. much to some students’ displeasure. Many did not have the chance to speak in the time allotted by the university and had to leave without getting their turn. The event was organized in response to the student occupation of the 14th floor of the MB building on April 2. Around 70 students sat outside the door of Lowy’s office for nearly an hour demanding to speak with the president. Lowy met with the students and agreed to host a formal ‘town hall’ where they could express their opinions openly on the strike.